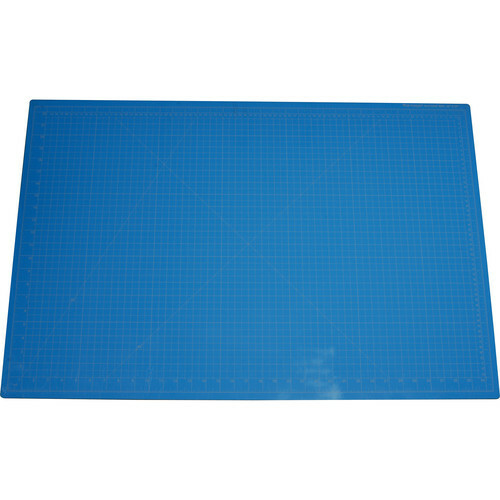 12 x 18" 18 x 24" 24 x 36" 36 x 48"
Photographers and artists sometimes need to trim a photograph or size paper down for a project, and the blue Vantage Self-Healing Cutting Mat from Dahle is designed to protect hard surfaces from blades, and prevents blades from becoming dull, which can happen if a blade repeatedly hits a hard surface. The 1/8" thick 12 x1 8" mat is made with 5-layers of PVC plastic to provide self-healing properties which prolong the life of the mat. The top surface of the mat has both inch and metric measurements with pre-printed 1/2" grid lines, which help you to size paper easily. The Self-Healing Cutting Mat can be used on either side, since each side has the same healing capability. Box Dimensions (LxWxH) 17.95 x 12.2 x 0.3"